Product prices and availability are accurate as of 2019-04-24 06:42:32 EDT and are subject to change. Any price and availability information displayed on http://www.amazon.com/ at the time of purchase will apply to the purchase of this product. Hunter Montesino 80708 4-Light bathroom fan brings beauty to the bathroom. Even as a striking design feature, this ultra-quiet bathroom fan is more than a quick way to keep the mirror from fogging. Hunter bathroom fans provide superior air movement to remove excess moisture from your home-and away from your family-before it creates an unhealthy environment. And Hunter's Prestige line is our best, most beautiful, quietest and highest performing line of bath fans. That is a truly beautiful thing, indeed. 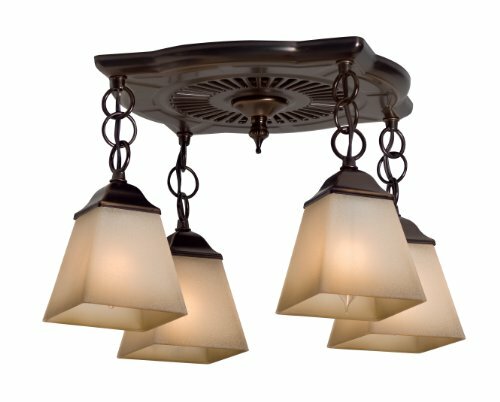 Designer Amber Beach Sand glass shades on the elegant semi-flush lighting complement the fan's bronze patina. Lights use four included A15 60W nightlight bulbs. The fan is designed for bathrooms up to 65 square feet and has an output of 70 CFM. 4-Inch duct diameter and requires an an 8-Inch x 8.5-Inch ceiling opening.